In a tiny corner of the United States, we’re creating Utopia for the entire planet. As Copiosis enters its 3rd year, we’re proud that we have launched not just one, but two demonstration projects showcasing our socioeconomic innovation we call Copiosis. One demonstration project is well underway and another (Kenton) launched in recent weeks. Here are some thoughts on our progress and what we’re learning as ordinary people conduct transactions in our innovation. Of course, with only 30 or so transactions, 10 participants, and 30 or so items being offered, it’s too early for formal studies or grand claims that Copiosis is changing behaviors. That said, initial evidence is quite positive, particularly reactions from participants who have conducted transactions. Diverse generosity. The main thing people are offering is something they know, a skill or knowledge that is easily shared with others. Professional skills, ones that can be shared at a distance, such as copyediting, life coaching, and reflective listening were immediate offers. This makes sense: It only costs producers’ time to deliver the item. Knowledge or skill has already been acquired and is essentially abundant and renewable. Not long after those listings came organic vegetables, gardening labor, books on gardening, landscaping consulting, even transportation to grocery stores or healthcare appointments. Participants are eager to offer things they are good at, things they have in abundance, and tangible things (such as books) sitting on the shelf that could be valuable to another. To me, this confirms that Copiosis can unleash a huge wave of generosity. Abundance is inspiring. People browsing the Demonstration Project landing page are thrilled, period. They are amazed at how much is being offered, often at no cost. This is a powerful advantage of Copiosis—with money out of the equation, not only can people get the things they need, producers typically benefit more than they would if dollars were in the picture. Goods bounded by NBR Gateways (analogous to, but not the same as, price) can be easily obtained by doing things that benefit others. Copiosis creates more positive, abundant communities. Things not ordinarily compensated now compensated and enthusiastically given. At the start of the project, the product with the highest NBR reward was someone offering a walk in the park. Recently a vegetable transaction triggered double the amount the walk triggered. The numbers aren’t material because we’re still understanding how the algorithm works. That said, the reward for taking someone on a walk was surprisingly high to some. Others were surprised that taking someone on a walk produced any reward. The algorithm is under constant improvement so those numbers may change. But it is a fact and will always remain so that in Copiosis anything that benefits another merits net-benefit reward. Of course, Copiosis was not designed to reward every act one does for another. Scratching someone’s back comes to mind. The concept behind NBR is many things people do today, and quite well, that benefit others tremendously capitalism doesn’t value. So people doing very worthwhile things receive no compensation. Copiosis’s NBR algorithm resolves what capitalism creates via its narrow-minded valuations that often leave some of the most important work being poorly rewarded. Participants identifying ways to improve the system. Already participants are offering ways to improve the software and the way the system is implemented. For example, in addition to a catalog of things producers are offering, participants suggested a separate catalog of things people are wanting. Such a catalog could stimulate people who may not know what to offer. I thought it was a great idea. Transparency in high demand. Another great idea was even more transparency. Copiosis is primarily open source, with its software available on GitHub and our algorithm also publicly available. One thing that isn’t currently public is how the payer organization determines the values which the algorithm uses to create NBR. These decisions weren’t meant to be shrouded. But in the rush to launch projects, we didn’t think people would care that much. That they do is fantastic. I’m working on making such decisions more public. Another transparency idea (one I hadn’t expected) was participants believe all NBR accounts should be publicly viewable. I liked that one too. A lot of work in the back end. The demonstration projects rely on version one of our software. It has only the essential features. We are working on improving that, but in the meantime, a LOT of work is required to supplement the software. Most of the heavy work involves pulling items from the software and adding them to the catalog, figuring out the variable values for each item class, creating and assigning item classes, communicating with participants and documenting problems, improvements, and more. The future of Copiosis looks promising. It’s rewarding to see the projects successful. The work I’m doing to keep them going is rewarding too. For I know the more work I’m doing, the more successful the projects become. They are doing exactly what I expected—stimulating interaction among participants and trades of products and services, identifying ways to improve the innovation, inspiring observers and participants alike, and stimulating more interest in what I believe to be the best solution to all of humanity’s problems. When money is not the motive, everything changes. NBR is not money, and it doesn’t feel like money. I’m surprised at how different it feels and how much relief it is to experience giving and receiving without any $$ transaction. Also, I gave benefit to someone in our project whom I didn’t know very well and it was very satisfying to expand my social interactions. I also feel a greater appreciation for other people’s time and energy; I know that they are offering benefit to be part of a larger more expansive experience. I have to say I also feel sad that I can’t bring myself to stop everything else I’m doing and just do this. With Kenton’s project launching on November 1, 2015, I expect more great things. 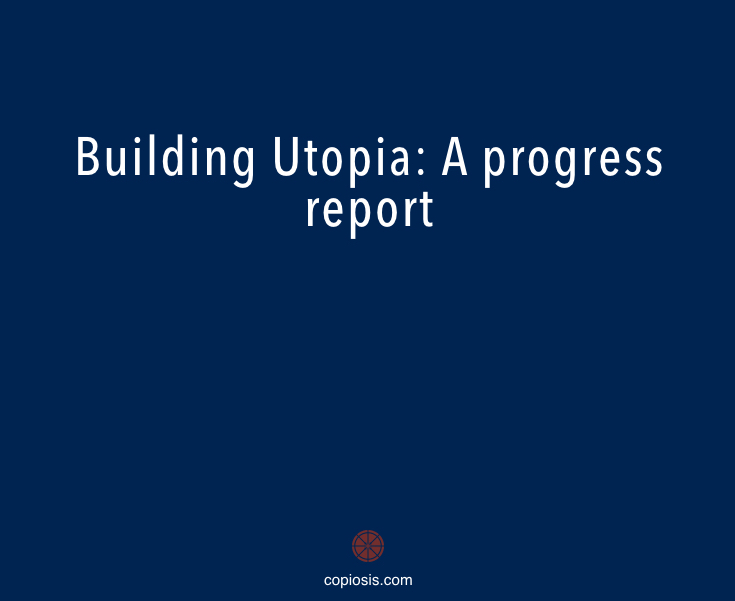 Who’d have thought creating Utopia would begin in the 21st Century?